A smart watch for a smart kid. 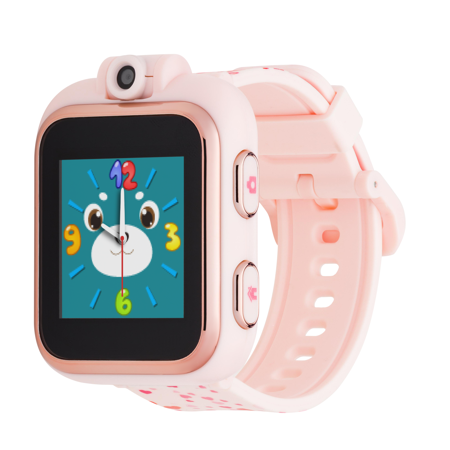 Connect your kid in style with the latest in kids smart watch technology! iTouch Playzoom Blush Pink Kids Smart Watch, Shampagne Rose Gold Case, Pink Dial, Blush Pink Printed Rubber Band Comes with advanced Smart Watch features such as: Camera, Video, Recording, Learning Games, Active Games, Photo Effects, Sound Animations, Wallpaper, Stopwatch, Alarm, Timer, Calendar, Computer Connector And Much More.. If your kid won't stop bugging you for a Smart Watch, get them a Playzoom Kids Smart Watch. The price keeps parents happy and the Smart Watch features will keep your kid happy with their snazzy new Smart Watch. Playzoom Kids Smart Watches are the perfect gift for any cool kid. Piece of junk. Won't change from display to clock. You can faintly see watch in background but that's it. I thought it was because the battery needed recharged, because I bought 2 and both were doing this, but charging the “watches “ didn't change a thing. Can't believe what junk these are. I am so grateful I decided to wrap these today because I would've been extremely disappointed if my kids would've experienced this on Xmas morning. Shame on you Playzoom!!! Total waste of money!!! Second picture is with extremely faint clock in background. Nothing works on either watch. Returning and getting Vtech instead! Has a black spot on the screan.